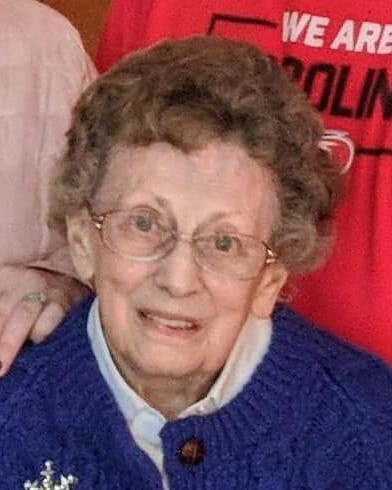 Annette M. Byrne, age 95, of Wauwatosa, peacefully entered into eternal rest while surrounded by her family on April 3, 2019. Annette was a quiet soul who liked to keep herself company. Although she preferred to stay in the background of things, her love and devotion to her family spoke volumes about her. She cherished her role as a wife, mother, grandmother, great-grandmother, aunt, sister, and friend to many. She enjoyed looking after her grandchildren; including ensuring that they were making responsible financial decisions. “Do you have a Roth IRA?” she would ask, too many times to count. Annette was meticulous about her own finances, too. She poured attention into every detail of her funds. She loved watching the news. It was a guarantee that she would always have CNN on in the background. Annette also took pleasure in bird watching, classical music and sewing. Among the family that will miss her dearly are her daughter Mary (Doug) Kruse, her grandchildren Robert (Abbey) Kruse, David (Meredith) Kruse, and Kathleen (significant other Will Blazek) Kruse; great granddaughter Eloise Adele Kruse; Mary’s sister Elizabeth (Jim) Michaels Spencer; her brother Clem Acker; goddaughter Sherrie (David) Schwoegler; and is further survived by many loving nieces, nephews, and San Camillo friends. Annette is preceded in death by her husband Tom Byrne; dear son Dennis Byrne; parents Laura and Clem Acker; sister Harriet; and many loving in-laws. Services for Annette will be held on Wednesday, April 10, 2019 at St. Joseph’s Catholic Church (12130 W Center St, Wauwatosa, WI 53222). A visitation for family and friends will take place from 9:30am until time of Mass of Christian Burial at 11:00am.